It's time again for our annual fundraiser. The good folks at Good People are hosting us. Beer, and tall bike jousting! How could this not be a blast? 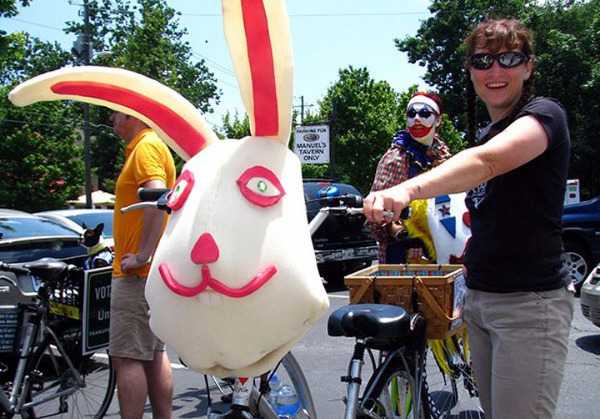 Get ready now to participate in the Visionary Bicycle Parade! Be creative, with your costume and bicycle because you can win some pretty fantastic prizes! Even better, get a team together! But most of all, you will be part of an event like never seen in Birmingham. Hosted by Ala Bike. More details coming soon! Join Us for the 7th Annual Tour de Blue! The Tour de Blue century ride starts and finishes at the Red Diamond corporate campus in Moody, Alabama (just outside Birmingham). There are several distance options (Century, 75 & 50 miles), and we anticipate adding a short option this year. Funds raised from the event support the Urology Health Foundation‘s prostate cancer screening and awareness efforts across Alabama. Not only does this ride benefit a great cause, but it is a fun event as well. It is non-competitive, you get to cycle with others and make new friends, and it offers one of the great scenic rides in this state. The Urology Health Foundation is a locally based non-profit, and your dollars will stay here in Alabama. Early bird registration discounts are available on Active.com. Yelp is an Interactive Social knowledge database that ranks local businesses is your town. It's basicly the angie's list for resturaunts yea? And we are on it. They are throwing a big party bash at Good people Feb 16th where there will be games and beer and fun. To top it all off theres a $5 suggested donation entry fee to get in and all of that goes to a certain charity into, I.E. Your truly. So Go there and have fun and give cuz your supporting us while you have fun! For years there was only one Bike coop around, working hard out of their basement space 2 nights a week to provide birmingham with used parts, bike workshop, and people to help fix or build your bicycle. This was the Bici coop, a super fantastic place to know of no matter how many bikes you own. I enjoyed many nights their just digging through the parts bins for buried treasures! If you have never been now's your chance! On Friday Dec, 13th our friends at Bici Coop are having their Christmas party. There you will be able to meet the 2014 board and enjoy your tummy to free beer and cookies! Not to mention chat it up with a bunch of bike lovers. If you can make delicious cookies then bring some so we don't run out! The shop is at 1211 28th st south Birmingham AL 35205 right off of Highland Park! Stan Palla is hosting a group ride this Saturday at 9:30 am from Pepper Place. All are welcome.